Just look at this moist, chocolatey slice of goodness that Pipkin's munching on! 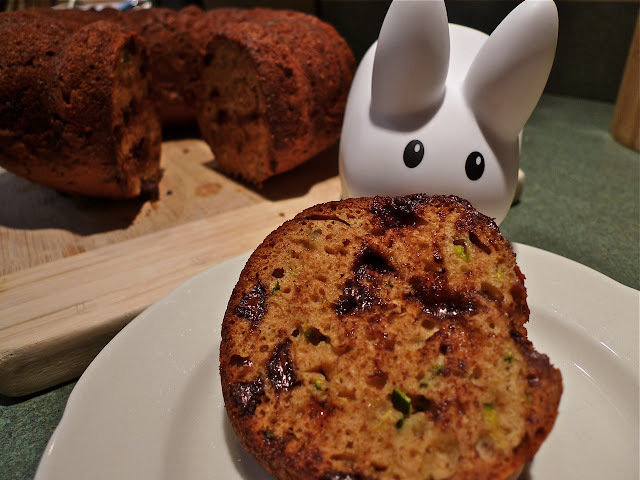 Can you believe it's zucchini bread? Who on earth ever looked at a zucchini and thought, "mmmmm, that would make fantastic bread?" His friends must have pointed and laughed at him. But then he made a loaf of deliciousness and his friends were too busy stuffing their faces to laugh at him again. True fact, I'm sure. Okay, totally made up, but the fact is, zucchini bread doesn't taste like some mystery green vegetable your mom makes you eat, it bakes up a really moist quick bread! 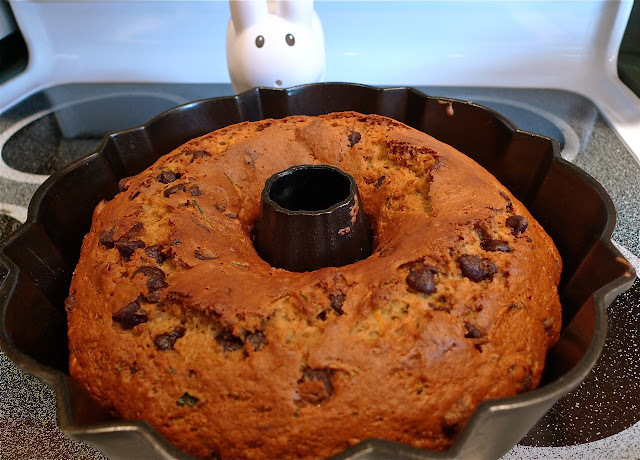 Add in some chocolate chips, orange zest and bake it in a bundt pan and it's practically cake. This recipe's easy and quick to make, and great to bring to parties! In fact, you might want to print out extra copies of the recipe to share. Print the recipe here. Don't forget salt! Pipkin always forgets one ingredient in the photo. In another large bowl, beat the eggs, then add sugar and continue to beat until light and fluffy. Stir in the applesauce, vanilla, zucchini and chocolate morsels. 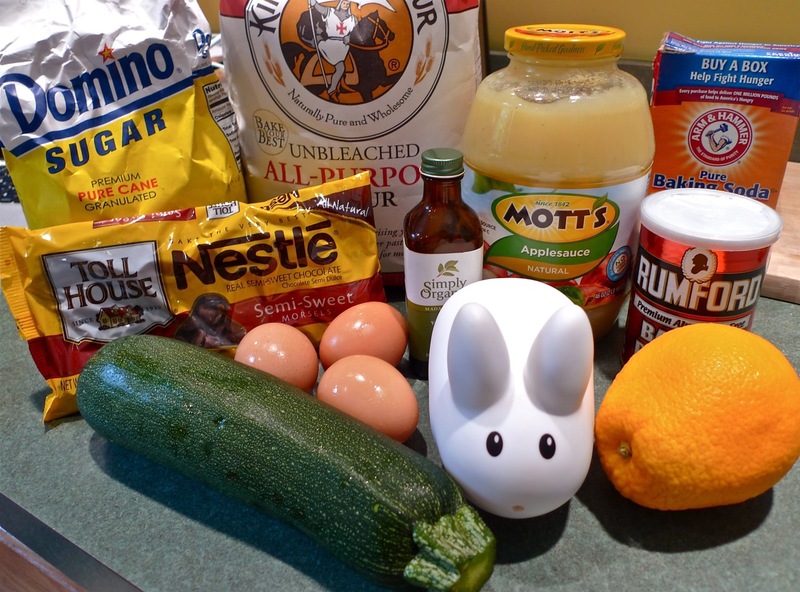 Add the egg mixture to the dry ingredients and stir well to blend. Pipkin admits that at this stage, it doesn't look so appetizing. 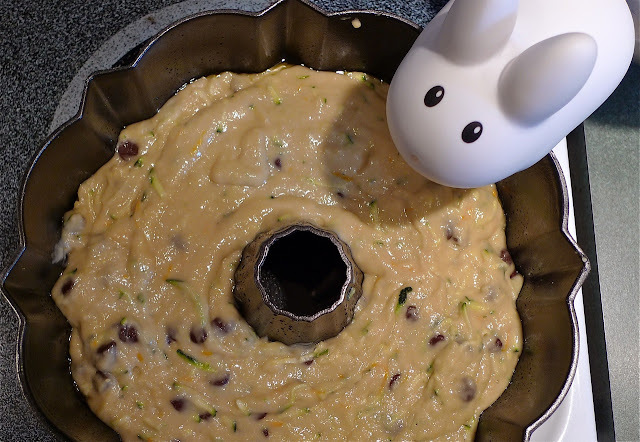 Pour it all into a greased bundt pan* and bake at 350ºF for one hour or until a toothpick inserted through the center of the cake comes out clean. Allow to cool slightly in the pan before flipping it over and serving. Yields: one bundt zucchini cakey bread. Enough for 12 - 16 servings. minutes at 350ºF, OR make a couple dozen muffins, baked for 20-22 minutes at 350ºF. Captain Holly Takes on Tough Mudder, Again!